Recently I've been thinking a lot of about art journals. 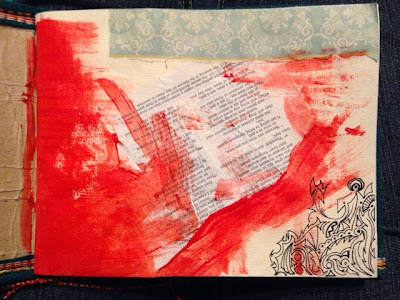 What is an art journal, you ask? Like art, art journals are difficult to define. Most involve turning the pages of a regular notebook or journal into collages, combining art with traditional journal- or diary-keeping. There are some really amazing examples of art journals online if you want to hop over to your favorite search engine and look them up. Most art journals involve gluing things on the pages, painting, drawing, even embroidering them, and incorporating writing into these collages. As you know, I'm an artist. I love art. And specifically, I love making collages. I mean, I really know my way around glue and scraps of paper and whatnot. Take my journal habit into consideration, and you'd think an art journal would seem like the most natural thing in the world for me, right? I've read blog posts on art journals, explored them on Pinterest, and played around with the idea of creating an art journal for about a year now, but I still have yet to enter that world. I don't know how to start! And when it comes to art, especially my own, my slight perfectionism kicks in full-blast. I want the "perfect" art journal! As if such a thing could possibly be determined. I think my problem is that I've thought about it too much. I've built this up in my mind until it's become a sort of far-off, barely-achievable journaling ideal. It's silly, really. Why should I feel so nervous about combining these two favorite things of mine? However, that's all about to change. I've just finished my latest journal, and I've decided my next one will be a art journal. I won't stress about it, I won't put hours upon hours of effort into each page, I won't strive for perfection. I'll simply open my journaling world a little more and let art explode all over the pages. So why am I telling you all of this? Because I want to share my art journal with you. My plan is to photograph my process and share this art journal with you. Each week I'll share pictures from the past week. And if you want, you're all more than welcome to join me! In fact, the more the merrier. Take pictures of your own art journal pages and then share them on my Facebook page or post them to Instagram with the hashtag #SeeMyJournal. Let's make some art journals together! Need a journal to get started in? Check out my shop, CaileysArt! Hi Cailey!! First of all, you're very talented!! I love the idea of an art journal. Thank you very much! I'm excited about it, especially now after these first few pages.